The device is powered with secure voltage; nevertheless, the user should be extra careful or should commission the installation to a qualified person. The outputs of the device should not be loaded with a current value exceeding 150mA. Do not remove the protective layer surrounding the module. Make sure that no metal parts of other devices or conductors come into close contact with the installed device. 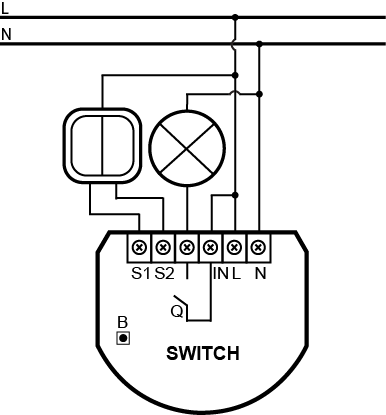 Do not connect other sensors than DS18B20 to the 1-wire line (terminals TP and TD). It is prohibited to connect the TP and TD lines to devices that are not compatible with the 1-wire protocol. Unused lines should be left insulated. Use conductors made from a single wire with a length of up to 30 meters in order to connect the DS18B20 sensors. Condition of outputs OUT1 and OUT2 is dependent only on the condition of corresponding inputs, irrespective of parameter settings or adding the device to the Z-wave network. Every time when any changes are made to the configuration of TP and TD lines (1-wire), e.g. 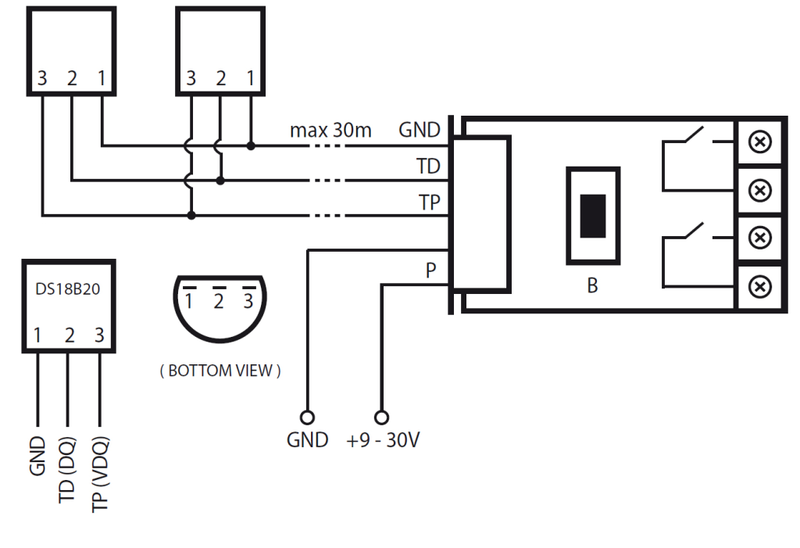 when DS18B20 sensor is connected/disconnected, it is necessary to execute the procedure of removing and re-adding the device to the Z-Wave network. It should be remembered that the system shall enter into the programming mode only once all the connected sensors have been detected (about 10 s). The DS18B20 sensor may easily be installed wherever very precise temperature measurements are required. Moreover, if proper protective measures are undertaken, the sensor may be used in humid environments or under water, it may be embedded in concrete or placed under the floor. Universal Binary Sensor is a multi-channel device. This means that it is equipped with two independent input circuits and a 1-wire bus allowing it to be connected to four DS18B20 temperature sensors. As a result, each device connected to the Sensor is represented by an independent icon in the system. 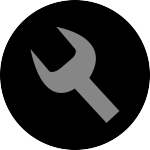 After the device has been added to the network, it shall be represented by appropriate icons in the Home Center controller, depending on the number of connected devices (3-7 icons). In the event of including the Sensor without any sensors connected (or with sensors connected only to IN1 and IN2), the device will be represented by three icons. If DS18B20 sensors are also connected, the devices will be represented by additional temperature icons. If the number of temperature sensor icons is different than the actual number of sensors connected to the device, or if the temperature readings are incorrect, you should inspect the connections on the 1-wire bus, in particular the connection between respective sensor outputs and the line and the total length of the bus (bus bar), which should not exceed 30m. Connect the power supply while holding the B-button. Connect the power supply again. After few seconds the device will be reset. FIBARO System makes it possible to set the device’s reaction to alarm events (reaction to the frame SENSOR_ALARM_REPORT). FIBARO UBS transmits alarm frames of different types, depending on the settings in parameters no. 5 and 6. The user should correctly declare the type of alarm frame for each connected sensor (inputs IN1 and IN2). For example, for a smoke detector connected to input IN1 the user should declare the frame type 1 – ALARM SMOKE (value of 1 should be entered), to ensure that the remaining devices will correctly recognize information on smoke detector alarm. 1st Association Group is assigned to input IN1 – sending command frames to the associated devices. 2nd Association Group is assigned to input IN2 – sending command frames to the associated devices. FIBARO Universal Binary Sensor in 1st and 2nd group allows to control 5 regular and 5 multichannel devices per an association group. 3rd group is reserved solely for the controller and hence only 1 node can be assigned. FIBARO Universal Binary Sensor allows to customize its operation to user’s needs. The settings are available in the FIBARO interface as simple options that may be chosen by selecting the appropriate box. Input no. 1 alarm cancellation delay. Additional delay after an alarm from input IN1 has ceased. The parameter allows you to specify additional time, after which the input no. 1 alarm is cancelled once its violation has ceased. Input no. 2 alarm cancellation delay. Additional delay after an alarm from input IN2 has ceased. The parameter allows you to specify additional time, after which the input no. 2 alarm is cancelled once its violation has ceased. Type of transmitted control frame for association group 1, activated via input IN1. The parameter allows to specify the type of alarm frame or to force transmission of control commands (BASIC_SET). Type of transmitted control frame for association group 2, activated via input IN2. The parameter allows to specify the type of alarm frame or to force transmission of control commands (BASIC_SET). Value of the parameter specifying the forced level of dimming / opening sun blinds when comes “switch on” / ”open” command to devices from association group no. 1. In the case of alarm frames the alarm priority is specified. Value of the parameter specifying the forced level of dimming / opening sun blinds when comes “switch on” / ”open” command to devices from association group no. 2. Deactivating transmission of the frame cancelling the alarm or the control frame deactivating the device (Basic). It allows for disabling the deactivation function or the alarm cancellation function for devices associated with the appropriate input of the device. Information concerning alarm violation or activation commands for devices from association groups are always sent. 1 – in the case of association group no. 1 the information is sent. In the case of association group no. 2 the information is not sent. 2 – in the case of association group no. 1 the information is not sent. In the case of association group no. 2 the information is sent. 3 – for 1 and 2 association groups information is not sent. Interval between successive readings of temperature from all sensors connected to the device. Interval between forcing to send report concerning the temperature conditions. The forced report is sent immediately after the next reading of temperature from the sensor, irrespective of the settings of parameter no. 12. Frequent sending of temperature condition reports is reasonable when the sensor is located somewhere where can occure rapid changes of ambient temperature. In other cases it is recommended to leave the parameter set to the default value. Insensitiveness to temperature changes. This is the maximum acceptable difference between the last reported temperature and the current temperature taken from the sensor. If the temperatures differ by the set value or more, then a report with the current temperature value is sent to the device assigned to association group no. 3. Intervals between taking readings from sensors are specified by parameter no. 10. Transmitting the alarm or control frame in “broadcast” mode (i.e. to all devices within range), information sent in this mode is not repeated by the mesh network. If the “broadcast” mode of information transmission is activated for a given channel, then transmission of information in “singlecast” mode to devices assigned to the association group of this channel is deactivated. The device offers the possibility of sending commands compatible with Command Class Scene Activation. Information is sent to the Z-Wave network controller. Controllers are able to interpret such commands and basing on these commands they activate scenes, to which specific scene IDs have been assigned. Inputs IN1 and IN2 are used to control the condition of the device. Each of them may force two conditions for corresponding device channels: on / alarm, off / no alarm. If monostable keys are used and the value of parameter no. 3 or no. 4 is set to 2, change of the state of corresponding channel will be able after a single click. 1. What is a Universal Binary Sensor? Universal Binary Sensor is a wireless module that makes it possible to improve the functionality of any sensor with a binary output by allowing it to communicate with the Z-Wave wireless network and the FIBARO System. Moreover, the module allows for wireless communication between the system and the DS18B20 temperature sensors. The device can service up to two binary sensors and up to four DS18B20 temperature sensors. The Sensor was designed for installation in the housing of a sensor or another device, the functionality of which we wish to improve. 2. What signals should be provided to IN1 and IN2 Inputs? There can be only GND signal. This signal should be common with GND of the Universal Sensor module. 3. Can I provide Voltage signal to IN1 or IN2? No, you cannot. It can be only GND signal. 4. How can I control OUT1 and OUT2? You cannot. The Universal Binary Sensor is input modules, so you cannot control its outputs. OUT1 and OUT 2 state is always dependent of IN1 and IN2 state. If IN1 state will be “1” than the same signal will appear on OUT1, if IN2 signal will be “0” than the same signal will appear on OUT2. 5. Why OUT1 and OUT2 cannot be controlled? Please notice that Universal Binary Sensor is Input module. It was designed to work with sensors and alarm systems, changing its state would be dangerous for security measures. 6. Can I measure temperature from Universal Sensor Module? If so, how can I do it? 7. 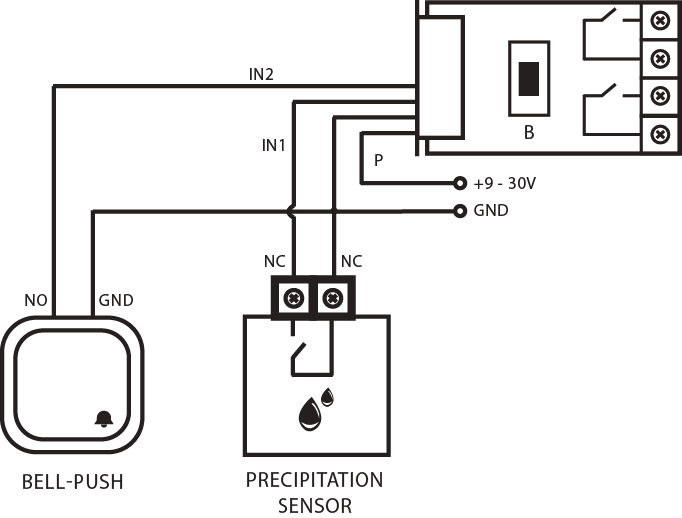 I’ve connected DS18B20 sensor to 1-wire line, but I cannot see any temperature sensors. After adding temperature sensors module needs to be configured again. Please remove your device and add it again. 8. How long can be 1-wire line for handling DS18B20 sensors? 9. What voltage Universal Binary Sensor should be powered by? You can connect DC voltage between 9 -30V DC. 10. Can I use other 1-wire devices than DS18B20 sensors? No – Universal Binary Sensor is compatible only with DS18B20 sensors. 11. What is the maximum current carrying capacity of outputs? 12. How accurate is DS18B20 sensor? DS18B20 sensor is accurate to 0.5C. 13. Should I calibrate DS18B20 sensor? No, DS18B20 is a digital sensor so there is no need to calibrate it. Yes, Universal Binary Sensor has full repeating possibilities.